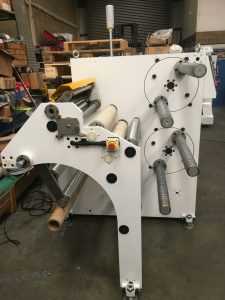 The slitter shown was produced for our customer, who was looking to improve finished product quality and also looking to improve and increase output, their existing slitter required a lot of manual handling to remove the finished rolls, and re-core for the next run, also the loading of the unwind roll was difficult and laborious. 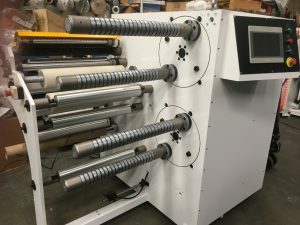 Most of their business was relatively short rewind runs with multiple narrow web width rolls. This machine was designed to fulfil the requirement of improving the finished roll quality and also increasing productivity. Reported back from the customer only this week is that the rolls being produced are far superior than anything previously achieved, and that productivity output has increased by 75% and the machine has only been in operation for 2 weeks, so this would be expected to increase as there systems and setup become more streamlined. Always good to have really positive feedback.